Dover Publications, Incorporated, 2010. Paperback. Very Good. Disclaimer:A copy that has been read, but remains in excellent condition. Pages are intact and are not marred by notes or highlighting, but may contain a neat previous owner name. The spine remains undamaged. At ThriftBooks, our motto is: Read More, Spend Less.Dust jacket quality is not guaranteed. Dover Publications, 2010-11-18. Paperback. Very Good. Dover Publications. Used - Very Good. Great condition for a used book! Minimal wear. Dover Publications. Used - Good. Shows some signs of wear, and may have some markings on the inside. Dover Publications. PAPERBACK. 0486601412 Remainder mark . Fine. Dover Publications. PAPERBACK. 0486601412 . New. Dover Publications. PAPERBACK. 0486601412 *LIKE NEW* Ships Same Day or Next! . Fine. Dover Publications. PAPERBACK. 0486601412 *BRAND NEW* Ships Same Day or Next! . New. Dover Pubns, December 1950. Paperback. Good condition . Dover Publications. 1950. Softcover. 0486601412 . good condition with minor soiling xlibrary with usual markings, translated from German by Frederick Bagemihl; B048857 . Dover Publications. PAPERBACK. 0486601412 Special order direct from the distributor . New. Dover, 1950. Soft Cover. Very Good. No markings. More modern printing. 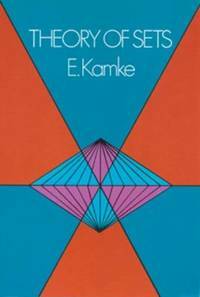 First English translation of the second German edition of Mengenlehere by E. Kame. 144 pages. New York, NY: Dover Publications, Inc., 1950. Paperback. Very Good. Size=5.5"x8". (full book description) Dover Publications, Inc., New York, NY, 1950. REPRINT Edition VG+, Paperback, Size=5.5"x8", 144pgs(Index). Owner name embossment on front endpaper, Title Page, small ink date stamp, numbers (2) on rear endpaper, o.w. clean, bright & very tight. Rest of book in Almost New condition. 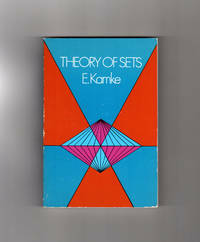 ISBN 0486601412 [Mathematics; Set Theory; Arbitrary Sets; Ordered Sets; Well Ordered Sets] SELLING WORLDWIDE SINCE 1987. WE ALWAYS PACK WITH GREAT CARE! Dover Publications, 2010-11-18. Paperback. Good. UK: Dover Publications. good copy, light rubbing to cover edge. . Very Good. Paperback. 2010. Dover Publications, 2010-11-18. Paperback. Used:Good.